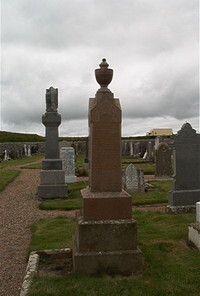 Erected by William Bryden of Bruan in loving memory of his wife. Emilia F Sutherland died 7th March 1917 aged 55. Son Donald Sutherland Bryden Lance Corporal Royal Scots killed in France 6th July 1916 aged 20. Husband William Bryden died 16th April 1940 aged 78.